Literature Lab™ -- Complex concepts, once impossible to search, are now revealed in a few clicks. Literature Lab™ mines PubMed to find answers you have always wanted. Our human-curated gene thesaurus sets us apart. At the core of the Literature Lab™ database is the Acumenta Biotech Gene Thesaurus, a repository of gene, protein and pathway nomenclature gathered from the major genomic databases and human-curated to produce searches with high precision and high recall. Driven by our analytical perspective and deep understanding of search, Literature Lab™ enables queries that satisfy our users' curiosity and creative thinking while eliminating the hindrance of syntax rules and cryptic commands. UNEARTH Gene References buried in the Literature. The Literature Lab™ database contains all the gene, biological, and biochemical references in every PubMed abstract. With just a few clicks, you can view the genes, pathways and other biological and biochemical functions associated in the literature with your specific area of interest. 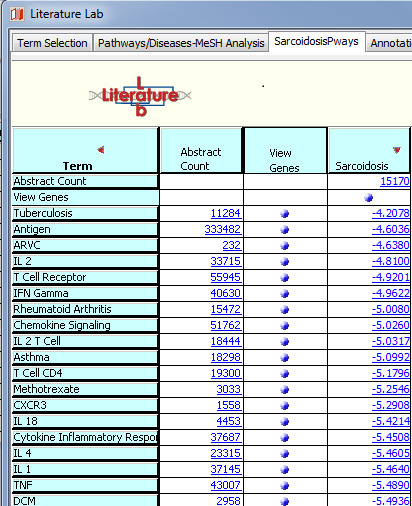 MORE THAN 800 Pathways in the literature lab™ database. Which pathways, drugs, chemical actions, inhibitors… are mentioned in the literature with a specific disease? A few clicks and you have the answer. The log of the product of frequency (LPF), shown in the screen images on these pages, is used to score the strength of associations between genes and biological terms, removing abstract volume bias and clarifying relationships in the literature. Identify concomitant diseases and genes involved. Literature Lab™ saves time investigating co-occurrences in the publication record. It simplifies exploring pathway, disease, and intervention concurrence, enabling scientists to think about the science, and not have to ponder what their searches are missing. While abstract counts are always provided (as are links to the abstracts), the LPF is used to rank co-occurrences. with just a few clicks, you can unlock Complex concepts that have been impossible to search until now. Which genes are associated in the literature with the insulin and inflammatory response pathways? A few clicks. And another click to review the abstracts behind any statistic. Get a free Literature Lab™ report on your area of interest. Would you like to see a functional analysis on the genes associated in the literature with a gene, a pathway, a disease, or a cellular function in your area of interest? It is simple to export the list and obtain a functional analysis with Literature Lab™ PLUS. Learn about Literature Lab™ PLUS.